Hospice care is personal medical care for the terminally ill. Our hospice team understands the needs to have the final moments of a family member or loved ones life to be as comfortable and compassionate as possible. This is why we focus not only on the medical needs of the patient but their mental and emotional states as well. Hospice care can include a number of medical professional working in tandem. Hospice teams can include the patient’s doctor, nurse, caregiver, bereavement, and support staff. 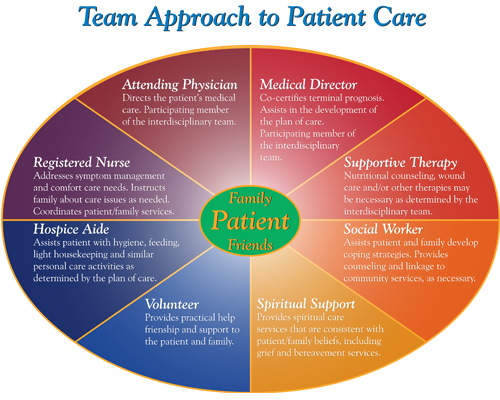 The team approach to hospice care makes certain all of the needs of the patient as well as the family are met. Many illnesses can have a need for hospice at a crucial point in a patient’s development. These illnesses may include Alzheimer’s, cancer, heart disease, liver disease, kidney disease, AIDS, Parkinson’s, and other terminal diagnoses. Assisted hospice care provides compassionate comfort care to persons with a life-limiting illness. A team of dedicated doctors, nurses, counselors and volunteers offers physical, emotional, and spiritual support. Assisted’s Hospice employees and volunteers treat patients and loved ones with exceptional warmth and skill. You can trust us during this very special and important time. A physician’s order is not required to receive information about hospice care. Have questions about hospice services or insurance coverage? Call us at 800-949-6555. We’ll help you to get the answers—and the hospice care—you need.